The long-awaited answer for Arai Signet wearers who simply couldn't find a helmet quite ergonomic enough for the head shape has finally arrived. The brand new Arai Siqnet-Q Helmet has arrived in a major way for Fall 2011, bringing with it seven years' worth of features and technologies that Arai Helmets has been developing and implementing into their other lids. It is a full 5mm longer front-to-back than Arai's current long-oval, the Arai Profile, and should be the solution for riders whose heads are simply too long and narrow for anything on the market at present. Boasting all of the features and functionality that have made the Arai RX-Q such a smash hit across multiple riding styles, the Arai Signet Q is almost guaranteed to be a grand slam. At first glance, it may be a bit hard to tell the Signet Q apart from the RX-Q. What really separates them is the interior and a couple of other key features. Again, there is a full 5mm front-to-back additional space, but this helmet is also using an upgraded comfort liner and cheekpads. Still using Dry-Cool antimicrobial and moisture wicking materials and still completely removable and washable, what you now have is 5mm peel-away foam zones on each side of the comfort liner. This is a feature first seen in the Vector 2 from Arai, and really allows for another level of customization in terms of the internal shape of this helmet. The comfort liner also has all seams and connection points moved away from areas that would cause pressure and discomfort. In addition, the cheekpads now use the Facial Contour Support system, which utilizes a dense foam insert along the jawline which creates a snugger fit and a better seal against wind noise. Another huge upgrade here is the incorporation of a Pinlock Max-Vision face shield. 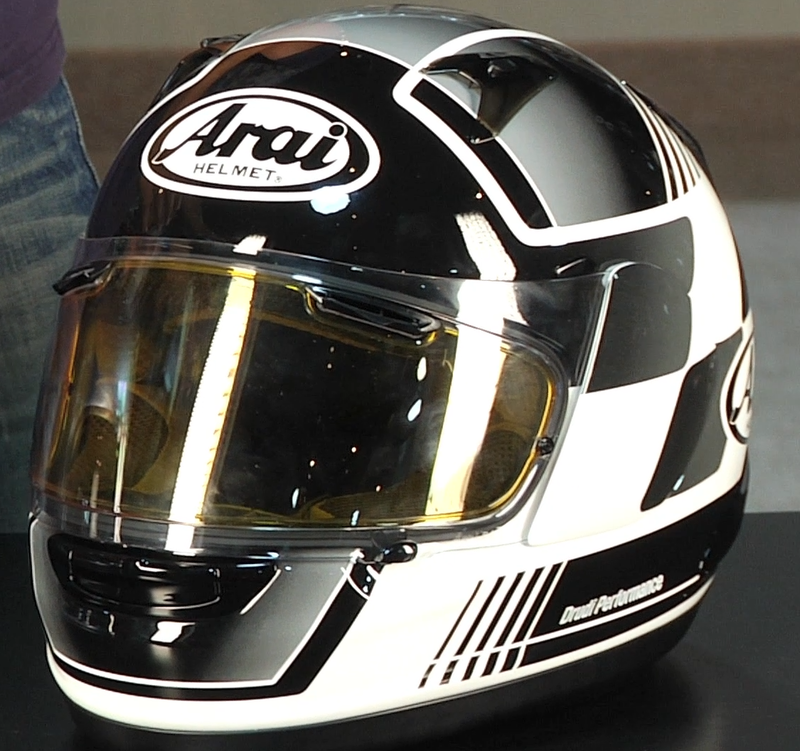 Arai teamed up with Pinlock, the leader in fog-free shield systems, to make an OEM faceshield (the Arai SAI) that incorporates both Arai's signature brow vents that pull air in and cool the temporal artery, in addition to the Max-Vision Pinlock lens, which offers the highest top-to-bottom field of view that they offer. The pinlock posts are built into the shield, and the installation of the lens, which comes in the box, can take place in a matter of seconds. Pinlock has perfected the fog-free lens, utilizing a chemical coating on the surface that is hydrophilic, and also creating a a window pane effect between the two layers that simply will not allow your visor to fog up. This is a major upgrade for the long-distance touring rider. Beyond the upgrades, you're looking at a ventilation system very similar to the RX-Q, with top intakes, rear exhausts, and side exhaust cowls that offer diffusing and stability. 10mm vent holes are channeled through the multi-density EPS liner for maximum head cooling on seriously hot rides. The Signet-Q is both DOT and Snell certified, using the Arai Super CLC shell construction, which is an amalgamation of exotic fibers to create a lightweight yet extremely resilient shell. Arai's signature hyper-ridge can also be found along the bottom edge of the helmet, which is essentially a speed bump for energy, keeping it within the shell and not allowing impact shock to transfer to your body. Arai builds every one of their helmets to a safety standard, with each price increase essentially paying for more premium materials lending to a lighter shell. The Signet-Q is no different. There is no question that this helmet is going to be extremely popular amongst former Signet wearers. However, it will also help out all the riders who haven't been able to find the helmet that perfectly fit their long oval headform. Welcome to the party, Signet Q.